Today’s post is from the lovely Amber of the blog, Bluebonnets and Brownies. Amber and I developed a friendship through twitter over a year ago and finally met last October at BlogHer Food. She is one of the sweetest, wittiest and most genuine people I know, plus, she’s got the hook up to some fabulous English candy! If you are not familiar with her blog, definitely head over and check out her delicious Tex-Mex cooking. When Jamie asked me to guest post during her Peanut Butter week, I was beyond stoked. Peanut butter is pretty much my favorite food. It’s definitely in the top five. When I lived in England, I used to import my favorite brand because the Brits, they just don’t seem to get peanut butter. There aren’t even any peanut butter and chocolate candy bars there. Isn’t that just sad? 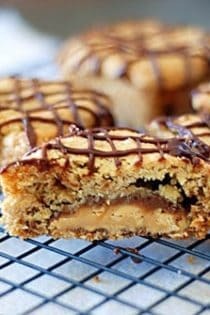 One bite of the little peanut buttery, caramel, chocolate, more peanut and nougat wondrous-ness, and my mind darted into all its recipe development recesses. WHAT could I do with this? Its perfection deserved much more than just me hoovering it into my mouth at top speed directly from the wrapper. Inspiration came the next day from two things. I opened my cupboard and was reminded of my mini-square cake and muffin pan, which I had yet to use, and I visited my dear friend Annie’s food blog, With Sprinkles On Top. Annie had just posted a recipe for thin and crispy oatmeal cookies. Now you’re talking! What’s better than a Peanut Butter Snickers? 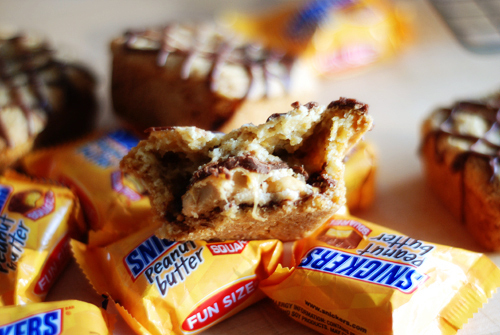 A Peanut Butter Snickers enveloped in crispy oatmeal cookie dough, that’s what. I was super glad for the square pan, because it mimics the square shape of the Peanut Butter Snickers perfectly. But you don’t have to buy a special pan. Just use a muffin pan instead, and you’ll have round treats instead of square ones. These babies are great for a solid 5 days after baking if kept in an airtight container. My husband’s coworker Steve would like me to pass on that he recommends nuking your cookie for 30 seconds before enjoying. Apparently, Steve ate about 6 of these the day my husband took them to the office. I’ll let Steve’s wife worry about his cholesterol, at least they weren’t in my house tempting me any longer. Because, if I’m honest, I have zero self control. Especially where peanut butter is concerned. 1. Freeze Snickers Peanut Butter Fun Size for at least 2 hours before preparations begin. Preheat the oven to 350F. Spray baking tray with cooking spray for baking, or butter and flour. 2. In a medium sized bowl, whisk together flour, baking powder and soda, and salt. 3. In a large mixing bowl, beat together the softened butter and both sugars until light and fluffy, scraping the sides often. Add the egg and vanilla and beat again until fully incorporated, again scraping the sides. 4. Add the flour mixture a little at a time, mixing on slow speed after each addition. When fully combined, begin to add the oats, mixing again. Stir the dough by hand once more, scraping the sides and bottom of the bowl to make sure there aren't any pockets of flour or oats that aren't mixed in. 5. Remove Snickers from freezer and unwrap 12 pieces. Using an ice cream scoop, scoop out a ball of dough and place it into the palm of your clean and dry hand. Flatten the dough a bit between your two palms, and then place the a frozen Snickers in the middle of the dough. 6. Using your hands, force the dough to mold around the candy piece until it is completely covered in the dough, with no holes or cracks. You should not be able to see the chocolate of the Snickers at all. Place the now square-shaped dough ball into one of the cups in your pan. Repeat until you have used all the dough. 7. I yielded 12 with a little left over dough that I turned into about 3 plain oatmeal cookies, but if you have more Snickers, feel free to make more than 12. 8. Bake until the cookies are a deep golden brown, between 14 and 17 minutes. Rotate the baking sheet halfway through the cooking time to get optimal browning. Allow to cool in pan for 10 minutes, then move to a wire cooling rack. When entirely cool, decorate with chocolate icing. 1. Melt the chocolate chips in the microwave, 30 seconds at a time. Stop and stir after each 30 seconds until completely melted. Add the powdered sugar and stir until completely dissolved. This should thicken the chocolate considerably. 2. Spoon melted chocolate into a medium sized ziploc bag. Press out the air and seal tightly, twisting the bag so that all the chocolate moves into the corner of the bag. Alternatively, use a disposable piping bag. Cut a very tiny corner off the ziploc or piping bag, and then decorate the Snickerdoos to your desire, with stripes, cross hatching, zigzags, or dots. Oatmeal cookies are my all time favorite. And I’m pretty sure that oatmeal cookies stuffed with candy bars could be my NEW all time favorite. Those look sinful, Amber! So good! Thanks for having me guest post, Jamie. These really are decadent, and so so good! These make me wish I wasn’t allergic to peanuts! Gorgeous photos too! In love with this cookie! These look INCREDIBLE. Straight to the must-make list. Becca, do what I did and get one bar from the convenience store to see if you like it. I know what you mean about the Reece’s peanut butter, it’s too sugary and makes my teeth hurt. The Snickers Peanut Butter though, is perfect. Hi! I think Jamie and I have the same answer here, because I’ve asked her before. Most of the time, I taste what I’ve made to make sure it’s good and post-worthy, and then it goes straight to work with my husband. I work from home, otherwise I’d take the stuff to my work too, which I think Jamie does. My husband is legendary in his office because he’s always got baked goods on him. I think it’s made him quite the negotiator in the office too! Such a fun guest post! I love Amber! You know it, Christina. YOU KNOW IT! Love the recipe but how much is a “stick of butter”. I’m in Australia so we use either cups or grams tks. Can’t wait to try them! Hi! In the US, a stick of butter is 1/2 a cup, or roughly 114 grams, so two sticks of butter would be 1 cup or roughly 230 grams. Tks heaps now I can try them yum! Ohhhhhh noooooo. I’ve been successfully avoiding the whole “stuff something inside a chocolate chip cookie” thing that’s happening lately – but I think I just met my match. I love oatmeal cookies. And you said Peanut Butter. Stephanie, they really are phenomenal. I did not want to use a chocolate chip cookie because I thought more chocolate would just overwhelm the palate. The oatmeal cookie is perfectly crisp, and as you bite into the cookie, you get crunch from the peanuts too. But you also get ooeygooey melted caramel and chocolate. Winner. So much fun! I love this idea. I haven’t tried the new Snickers, but for these cookies, it sounds like I need to. Just curious…What kind of “baking tray” are you using? A muffin tin? A silicon mold? Just baking them as cookies on a cookie sheet? The directions are not to very clear. thanks. HaB, I used a square cake/muffin tin, as in the wells are square shaped instead of round. But as I said in the narrative, you can use a regular muffin/cupcake pan, your treats will just be round instead of square. I only have metal pans, but I’m sure a silicone mold would work. I’m not sure though, that you would get the same crispness a metal pan will provide. Amber…I must have read this post a dozen times looking for what you used pan wise. I’m sorry – as I just skimmed again after reading your reply and saw where you mentioned the pan. I’ve seen the square cake/muffin pans a few places. Making these just might be a good enough reason to get one. Thanks! HaB – no worries. That’s happened to me on a dozen occasions at least! OMG. I have been reading your blog for months now and today I came to visit and found this posting. I read it to my husband and he is now saying, YA KNOW, you have one of those square muffin pans in there that you have owned for over a year now and NEVER used. I think I need some cookies. HAHA. The first time I saw these candy bars I bought one right then, I thought oh I will share it with hubby in comes with two pieces. Needless to say I sat on the couch and ate BOTH of them, right there with him in the room. We searched for WEEKS before we found another one to buy and then the only way we found it was to buy a bag of the individually wrapped ones. Now we are out but now I have a reason to buy MORE!!! LOL. Love this post, thanks for sharing. We now have Reese’s cups in the UK! But they’ve taken a while to get over here. I’m a huge fan of peanut butter, but I’ve only ever had English peanut butter I guess, so I don’t know what the big difference is. Are you a crunchy or smooth person? Reese’s cups in the UK? Well I’ll never! Those were a required item for me to bring back on my trips home when I lived there. They wouldn’t allow me into work without those or Jolly Ranchers. I like both crunchy and smooth, though I’d say I choose smooth more often. Where I lived in the UK though, we couldn’t really *find* peanut butter, except for the imported Skippy. I do not love Skippy. This was over 5 years ago now, so I guess the UK has come a long way in it’s peanut butter love! This look sinful!! Oh, how my family would love these! Anything called “Snickeroos” is definitely worth trying. I haven’t sampled these new Snickers yet, but love to see that they already make them fun-sized! 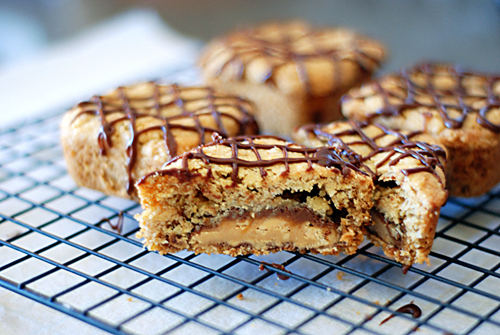 Snickers inside an oatmeal cookie…fabulous! I’m not sure I’d be able to wait until they cooled to eat them. Oh, I guess that’s not a problem (according to Steve). Where is the mini square cake/muffin pan? There’s no search field, I’d love to see this so I can run and get one! LOL. Thanks. I would love to make these tonight! Too bad I dion’t have the requisite Snickers bars:). Question: do these get baked on cookie sheet or mini muffin tins? The directions say baking pans then further down says place in one of the wells of the pan. Can you clarify when you have a second? The baking pans are square muffin tins. You can also use regular muffin tins if you don’t have the square ones on hand.